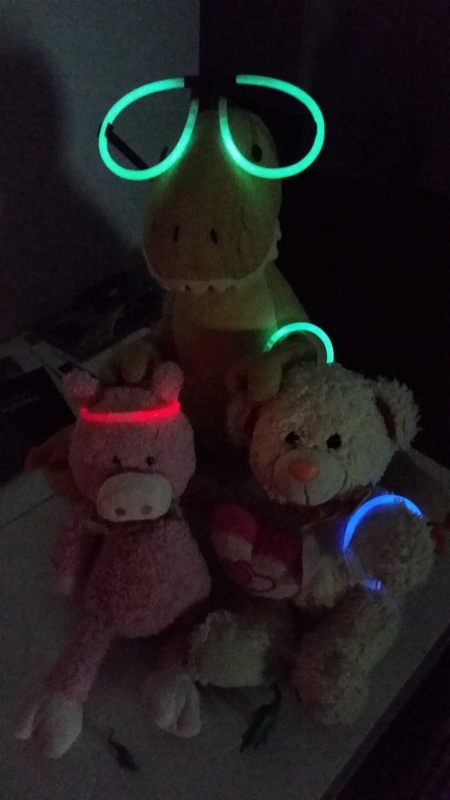 Greetings, and welcome to Dinosaur Bear’s first post of 2018! The holidays have now come and gone in a fair number of places, though they’re technically still going until the 6th in Iceland (though my classes have already started, thanks to a professor who thinks it’s ok to start classes before the university semester eve begins)! That means that it’s a good time to reflect on all the good fun and good beer the holiday season brought. 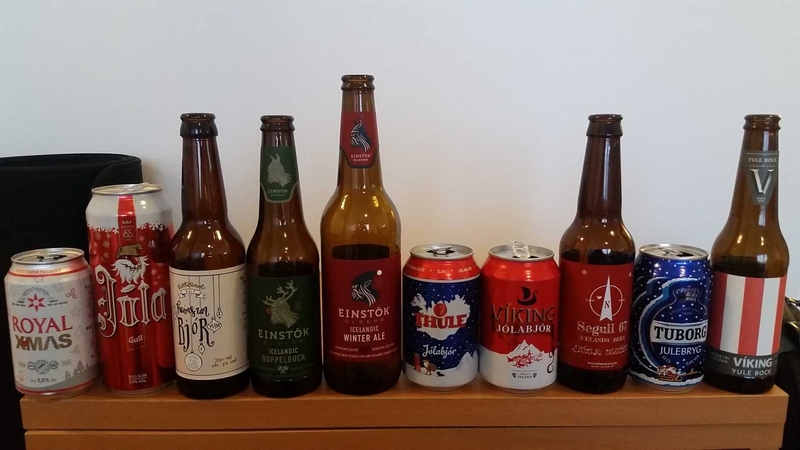 Chiefly, I am quite proud of the good run of Christmas Beer (Jólabjór) I had, pictured here in chronological order from left (oldest) to right (newest). Woo look at those Untappd stats go! I ended with the Viking Yule Bock on New Year’s Day, which seemed like a fitting time to complete my collection. 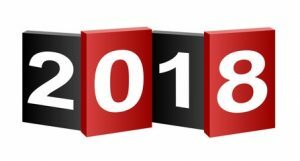 In truth, I wasn’t really planning on making a new year’s post as I felt like the “closeout” post from last time, which was quite extensive, offered up a good bit of coverage. I was just planning on mentioning the beer in a future post and leaving that at that. However, sometimes something happens that is just profoundly blog-worthy, and sometimes such a thing (literally) comes in with a bang. 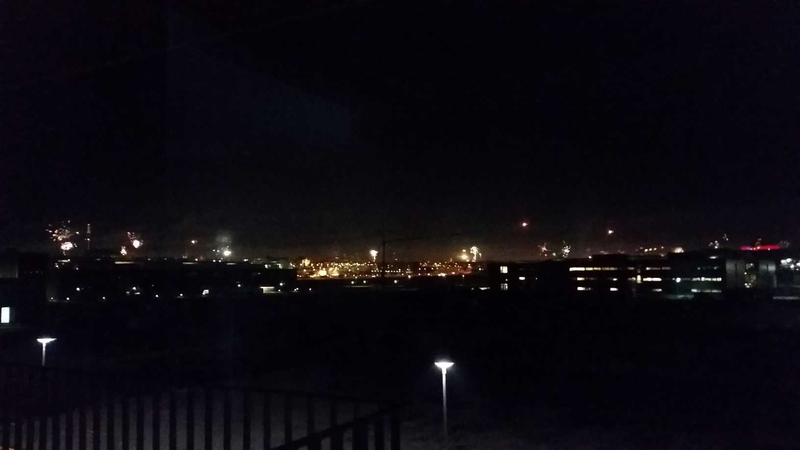 Yes, SB and I got to experience New Year’s Eve in Iceland, and boy oh boy, was it a spectacle. 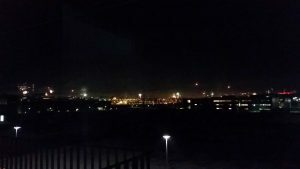 Unlike many cities, Reykjavík has no formal fireworks display on New Years. What!? You might ask. Well, you needn’t worry. Despite having no “official” fireworks display, the fireworks that went off here were absolutely mind-boggling, and far, FAR surpassed anything I’ve ever seen. How so? Well, you could almost call it “crowd sourcing” a giant, mutli-hour long fireworks display. SB and I knew that fireworks were big here (literally and figuratively), but we had just no idea how big. Per the city of Reykjavík’s website, over 500 tons. 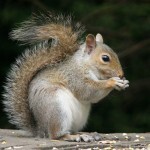 Yes 500+ tons, of fireworks are launched by the local denizens. I find that number entirely believable. Now, if you read my previous post, you’ll noticed that I mentioned “10-15 spontaneous displays” starting at 2pm and going quite late in the days leading up to the New Year. The funny thing, is that I actually edited that upward from 5-10. Turns out the fun was only just beginning. The evening of New Year’s Eve started.. well, more around like 12:30pm and then lasted until sometime after we went to bed at 2am the next morning. The fireworks started well within our narrow band of daylight (impatient, lol) and then really began to pick up once it got dark in the afternoon. Before too long it sounded and looked like we were in a war zone. As a photo won’t do it much justice, I’m going to try to post a video here. I rarely post videos via the blog interface, so we’ll see how this works. You’ll definitely need volume to fully appreciate the war zone like vibe to it. Assuming that works properly for you, you’ll have hopefully heard what I was referring to with the war zone bit. That went on for hours, and hours. Until eventually the entire horizon (and right next to us) was just a smattering of slowly escalating fireworks and flares, lots of flares too. The interesting bit is that yes, the fireworks build and build, but then right around 10:30pm they almost entirely stop. Indeed, if you pay attention you’ll notice that pretty much everything stops. Suddenly there’s no traffic, no party noise, and only a few pockets of fireworks continue paired with a lone flare or two lazily floating towards the earth. What is so particular about 10:30pm you might ask? Áramótaskaupið. Yeah, try saying that one five times fast. Áramótaskaupið, which translates to “New Year’s Eve’s Ridicule” is a television show that airs from 10:30pm to roughly 11:30pm on New Year’s Eve in Iceland, and has without fail since 1966. Áramótaskaupið, or often, just “skaupið,” is a comedy/variety show that focuses on the closing year from an extremely satirical standpoint. It’s known for being quite ruthless in its portrayal of events, individuals, trends, etc. It’s also insanely popular with Icelanders. Not only are the ratings some of the highest in the world, skaupið also retains a massive percentage of the country’s population as viewers. Some years have seen the viewing numbers as high as 95.5% of the country’s population. I don’t mean viewing population, I mean, literally, 95.5% of the entire country watched the show. While not confirmed by any record-keeping source that I can fine, this viewership has been said to be a record in television history. So, things get quiet for a little while because almost everyone has just went inside to watch Áramótaskaupið. We watched it too! Granted, it’s almost entirely in Icelandic (aside from a few bits making fun of tourists), so we were a bit limited in the uptake, but a few skits required no comprehension of Icelandic to appreciate. Of course, the real craziness comes after Áramótaskaupið ends, usually sometime in the 11:20 – 11:30pm range. As everyone goes back to their fireworks arsenal, things begin to build exponentially, especially around 11:35pm as all battle stations are manned again by then. The result is an ever-building crescendo that builds so much steam it not only blows through the stroke of midnight, but keeps going well past the bell’s toll to the point that you can’t help but wonder if Iceland is fending off the largest aerial raid in human history. Here’s a video taken at some point around the midnight hour. But, as we didn’t really know what we were getting ourselves into, we had some other, smaller-scale festivities planned for the Dinosaur Bear household. You have to keep yourself busy in your concrete bunker during the fireworks apocalypse in order to avoid cabin fever, after all! 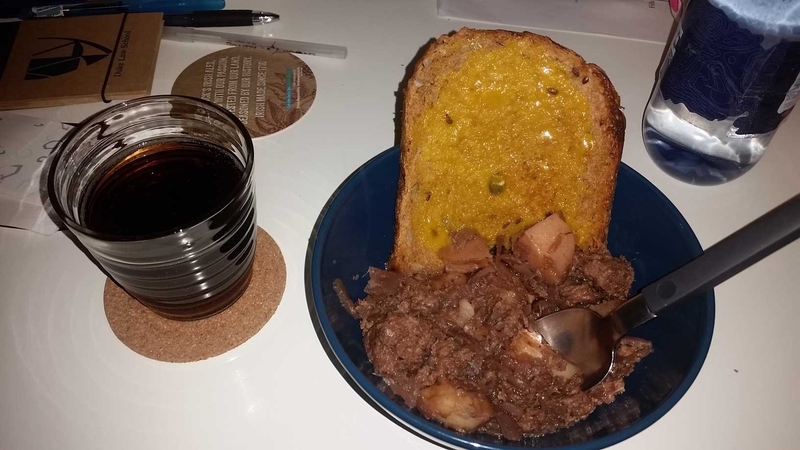 First, I made us some slow-cooked lamb stew, with beer, potatoes, red cabbage, onions, mushrooms, and a bunch of spices. We had it with toasted bread and “Sød Fransk Sennep” or Sweet French Mustard. It was quite yummy – plus we had leftovers for more New Year’s cabbage. We paired it with some also-yummy ice cream, and then later moved onto the drinks, of course! In addition to the aforementioned Christmas Beers, we also had a couple of specialty items. The first, is the famous Brennivín. Brennivín, which I’ve mentioned before, is an Icelandic unsweetened schnapps made from fermented grain or potato mash and flavored with caraway and is generally in the 37.5-40% ABV range. 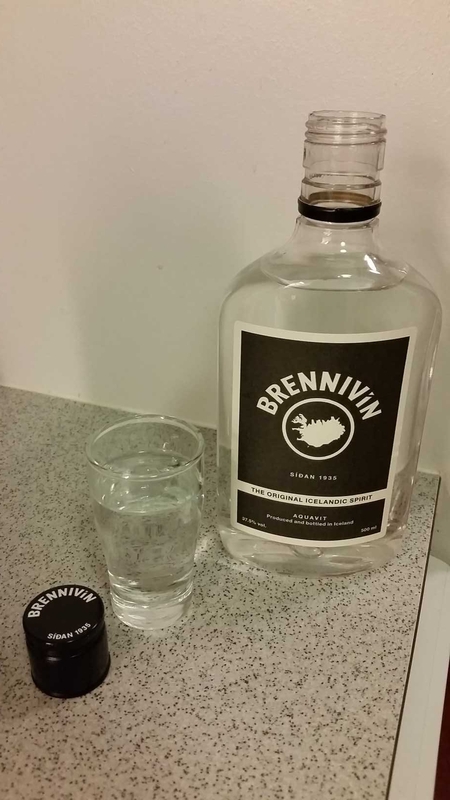 It’s unofficially Iceland’s Iceland’s signature distilled beverage and is the traditional drink for the mid-winter feast of Þorrablót. It’s also seen paired with kæstur hákarl, which I discussed in my Westfjords Post. It was SB and I’s first time having it (woo we’ve now had both it and kæstur hákarl), and despite not being hard alcohol people we both agreed it was pretty good (for hard alcohol). We tried it a few times straight to get it’s full flavor, and then experimented with mixing it into a few different things (orange juice: no, Sprite: yes). We both got a bit of a fruity/minty vibe from it and we much preferred it to vodka, with which it is sometimes compared but is actually quite different. 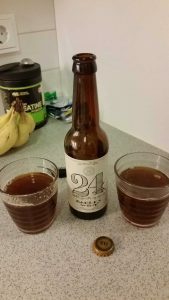 We also tried Barley Wine for the first time. We’d been meaning to try it for awhile, and SB actually picked some up a few weeks ago – we just decided to save it for the holidays. Our mutual reactions were Taco: 2.5/5.0 and SB 0.5/5.0 – so as you can see, lukewarm to outright disgust, lol. I actually ended up finishing SB’s for her, as I didn’t think it was nearly as bad as she did. It’s an interesting thing to describe, sort of beer, sort of really heavy wine, and our variety clocked in at 10% ABV. Would I drink it again? Yes. Would I drink it often? Definitely no. 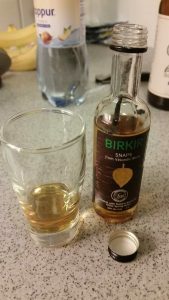 The last of our alcoholic adventures was this little fellow, Birkir Snaps. This drink was an impulse purchase, because it sounded interesting. Birkir Snaps is an Icelandic distilled grain spirit which uses Icelandic birch, picked during the spring, as its primary flavoring element. 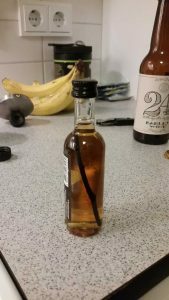 So yes, that is a twig you see in the bottle. It’s just a special Icelandic twig. Obviously this one had some very woody flavors, with a bit of freshness to it that I’m not well-versed enough in non-beer to describe. I liked it a bit less than the Brennivín, but it wasn’t so bad I couldn’t drink it. We still have a bit left, and will probably try mixing it with something, though the birch-flavor isn’t a typical mixing platform. Now, if our air raid fireworks, food, and copious amount of alcohol don’t sound like a good enough time for you, we also went full on rave. Yes, courtesy of a well-placed endcap at Bónus we picked up three glow-bracelets and a pair of glow-sunglasses for New Year’s. Naturally these quickly became the boys’, and it is the boys who retained them for almost the entire evening, complete with epic red Yule-lad candle lighting for their rave. 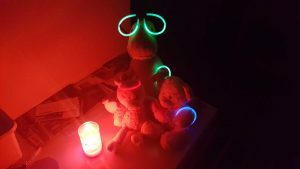 In fact, by the time we finally rolled into bed around 2:00am, Tristen wasn’t quite ready to stop the rave, so we booted up some classic Sandstorm and let him get in a few more sweet moves. 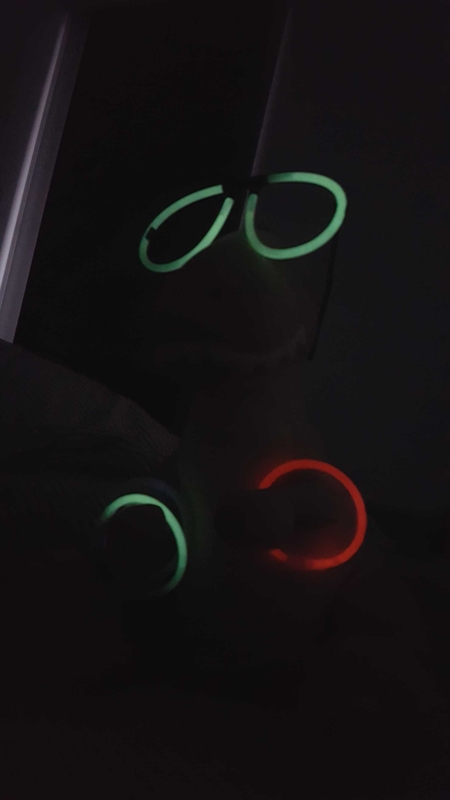 The funny thing is, despite the package saying that the bracelets/glasses would glow for 6 hours, the red and green bracelets lasted more like 12 hours, and the glasses lasted for about a solid 24 hours (though very faint by the end). Definitely good value for the small amount of money we paid for them. A ravers gotta rave, ya’ know. Anyways, that’s a good recap of our crazy, fireworks-laden New Year’s Eve exponanza. It was a lot of fun, and most certainly contained a bunch of unexpected surprises! I hope you had an enjoyable New Year’s celebration as well! Here’s to 2018! Those fireworks are “no joke” and sounded more like Libya in the 80s! I think they would have kicked my anxiety into full gear. Curious– did you find it odd that even with all of the fireworks exploding the visibility never diminished? In the U.S. often the smoke becomes so heavy after a few rounds that you cannot see the fireworks well, but in your video they were very clear. I think it might have been because of how dispersed they were. Rather than a huge amount in a short period in one localized area, it was a huge amount, over a long period, over a vast area. Also the coastal winds probably helped a lot. I will say that by 1am or so it was pretty hazy, but it took awhile to get to that point. 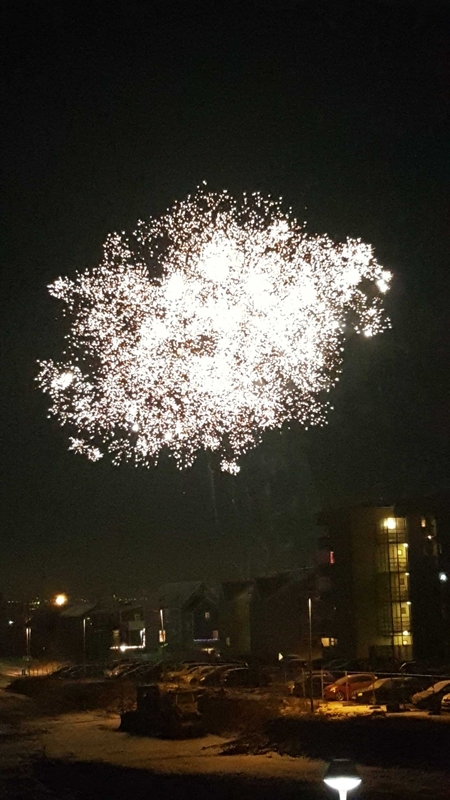 Yay, New Year’s in Iceland! We certainly made it fun for just staying home, and the crazy Icelanders helped out with their awesome fireworks show. That longer video did a great job of illustrating how many there actually were. What an experience! I am both jelly that I didn’t get to see it and happy for you that you did. You now have celebrated New Year’s Eve in two countries other than your own!